ATLANTA—Earlier this month, a woman in the Capitol Hill neighborhood of Seattle noticed a small camera-equipped drone buzzing around outside the third-floor window of her home. She sent her husband out to tell the man operating the small aircraft by remote control to leave, but he insisted that it was legal for him to fly above their property. “We are extremely concerned, as he could very easily be a criminal who plans to break into our house or a peeping-tom,” the woman complained in a note to a local blog. So was the drone operator right when he insisted that it was legal for him to fly above this woman’s yard? The question doesn’t have an easy answer, and it’s one that some drone researchers gathered this week in Atlanta for an international conference on unmanned aircraft are grappling with. Paul Voss, an engineer at Smith College who entered the drone field through his work developing the world’s smallest altitude-controlled meteorological balloons, gave a talk at the conference Wednesday titled “The Case for Protecting Privacy and Property Rights in the Lowermost Reaches of the Atmosphere.” He argued that the drone community should be proactive in addressing privacy concerns now, before the number of drones in flight skyrockets when regulations are eased in the next few years. At the beginning of his talk, Voss showed a photo of a drone hovering outside the second-floor window of a home, and asked the class, “How many of you think this is public airspace?” Only one person raised his hand. The court did, however, say that homeowners should have “exclusive control of the immediate reaches of the enveloping atmosphere” so that they can build homes, plant trees and erect fences, for example. It’s unclear how many feet in the air, exactly, that extends to, as Justice William O. Douglas did not go into detail in the opinion. That’s been the court’s final word, and the ruling suggests that drones can fly quite close above people’s property and be on safe legal ground. But the bigger threat to privacy is less likely to come from nosy neighbors with tiny camera-equipped model aircraft than from well-funded law enforcement agencies or businesses that can afford to launch sophisticated drones with high-power cameras. Brandon Stark, a drone researcher at the University of California, Merced, told the scientists at a workshop Tuesday that smaller drones are not yet sophisticated enough to merit privacy advocates’ concerns about spying. “If you’re flying [a small drone] 100 feet into the sky, you’re lucky to see a tree. Actually spying on people is fairly difficult and fairly expensive,” he said. Those who can actually afford the most powerful drones are likely to be law enforcement agencies with grants from the federal government, or businesses hoping to turn a profit. That could mean a big expansion in the ability of police to gather evidence and detect crime. A 1989 Supreme Court ruling held that police can use images from manned aircraft to aid their investigations without first obtaining a warrant. In that case, a sheriff discovered a man was growing marijuana in a greenhouse by sending a helicopter to fly overhead at just 400 feet without first having to prove to a judge he had good reason to search his home. 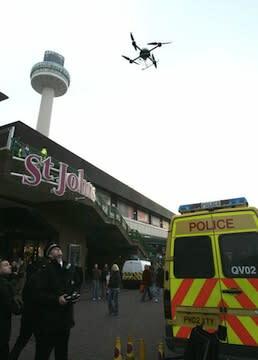 Privacy advocates are concerned that drones will take police power to another level, since drones could in theory hover around an area continuously, surveying from the skies and reporting any suspicious activity. But that’s all expected to change in 2015, when the agency is required by Congress to open up the skies to commercial uses of drones and attempt to integrate unmanned and manned aircraft. The agency estimates that nearly 10,000 new drones will be in flight in just the first few years after the commercial ban is lifted. It’s unclear whether the FAA will delve into any of the privacy issues when it issues its regulations on unmanned aircraft. Ted Wierzbanowski, a retired Air Force colonel who chaired a committee that made recommendations to the FAA on how to regulate small drones, said he believes the FAA should focus on safety, not privacy, in its regulations. “Someone else in the government should have to worry about privacy issues. Who that is, I don’t know,” he said. Amie Stepanovich, director of the Domestic Surveillance Project at the Electronic Privacy Information Center, said her organization is petitioning the FAA to require a publicly accessible registry of drones—where they’re flying, who is flying them, and what sort of data they are collecting—so that concerned citizens can look up their home and see who might be watching it. Congress, meanwhile, has shown some willingness to step in, with some Republican representatives working on a bill that would limit the police’s ability to use drones without first obtaining a warrant. Another possibility is that much of the privacy battles will be fought at the local level, with each state developing standards for how law enforcement can use drones and how to mediate disputes among neighbors who use drones. Dozens of states have introduced legislation just this year to limit the ways in which police departments can use drones.